Looking for an affordable serum? A body lotion that doesn't feel greasy? We've got you covered. From serums and scrubs to moisturizers and masks, there are so many skin-care products on the market, it can be hard to tell which ones you should be using. We're here to help! As part of our third annual People and TODAY Beauty Awards, we tested hundreds of products to find out which ones really work. We're also revealing our picks for makeup and hair, so stay tuned to the Fourth Hour of TODAY this week for more. 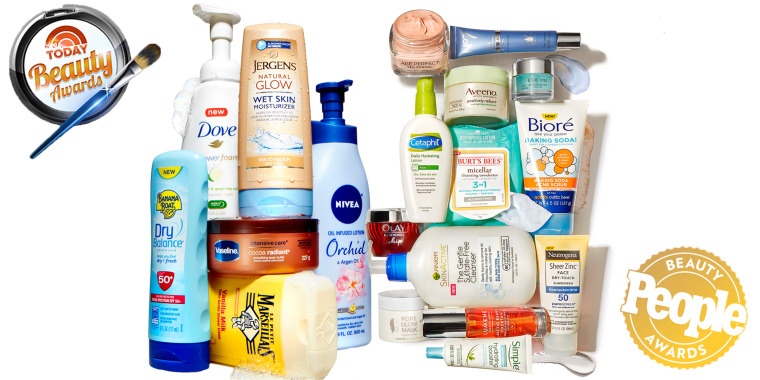 In the meantime, here are are favorite skin and body products — all at drugstore prices! Using a French body wash just makes us feel fancier. Plus, it smells great! It's the second best thing to a bubble bath. This trusted brand's shower foam is lightweight and leaves us feeling squeaky clean. "Everyone wanted to steal this from me!" one of our testers said of this luxurious body butter. These lotions, which come in a variety of scents, are lightweight but provide lots of moisture for parched skin, thanks to natural almond, jojoba and argan oils. We love this sunscreen because it dries with a soft matte finish, so there's no stickiness or shine. It's available as a spray or a lotion. "It feels a little strange to apply self tanner on wet skin, but the color payoff is amazing," one of our testers said. This cleanser strikes the perfect balance: It's strong enough to remove makeup and grime, but gentle enough to use on sensitive skin. Plus, no sulfates! This scrub contains baking soda and salicylic acid; heavy-duty ingredients to fight acne and exfoliate. "This face oil soaks in immediately and leaves your face with a glow," one of our testers said. "I will be using the entire bottle!" This powerful serum helps reduce wrinkles as well as firm and even out the skin tone. Yes, please! A moisturizer that's perfect for everyday use. Hyaluronic acid in the lotion helps the skin retain its moisture. This cream promises to reduce fine lines and wrinkles. It goes on heavy but still feels breathable, without any sticky or greasy residue. "My husband and I have been married for almost two decades and this is the first time he ever wanted one of my products," one of our testers said of this eye gel. Rejuvenate aging skin with this rosy moisturizer, which promises to help stimulate skin-surface renewal. Fans say it also gives their skin a healthy glow. It's not just for summer! Sunscreen is a must-have year-round, and this one is great because it's powerful and suitable for sensitive skin. And it doesn't leave our faces feeling sticky. Our testers loved how great their skin felt the morning after using this product. Hate taking your makeup off before bed? Try leaving these wipes on your nightstand as a friendly (and easy) reminder. If you have dry skin, this is your product. It can be used many ways: as a primer or mixed into your moisturizer, or as treatment applied only to dry patches. Cooling. Tightening. Brightening. Basically everything we want in one mask.